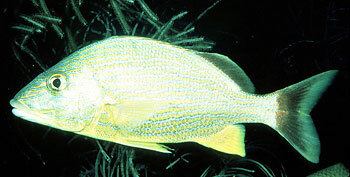 The bluestriped grunt ranges from Florida to Brazil including the Gulf of Mexico and Caribbean. Adults are found inhabiting coral and rocky reefs where they are active nocturnal predators of crustaceans, bivalves, and occasionally small fishes. Juveniles are more commonly found in Thalassia beds which provide adequate cover and foraging opportunities for smaller fish. Age at maturity and life span of this species are approximately 2 -3 and 10 years, respectively. Peak spawning is reported from January through April.As the name implies, grunts emit a “grunting” sound produced by stridulation of the pharyngeal teeth which may also be amplified by the swimbladder. These sounds are produced during feeding and also as a fright response when the fish is captured, handled or otherwise distressed.